Brexit deadlock leaves fertile grounds for the Pound and Euro to enter a consolidative pattern, however one study of the GBP/EUR exchange rate's technical charts shows the pair has fallen back into what could be considered a 'buyzone'. Pound Sterling fell 1.3% against the Euro last week, suggesting downside pressures are building on the exchange rate after what has otherwise been a good start to 2019. With the EU and UK reaching a deadlock on Brexit, we see fertile ground for consolidation in Pound Sterling and would only expect a major directional push coming when this deadlock is broken. Our latest technical studies meanwhile leave us neutral on the exchange rate, seeing risks for both an extension higher and lower depending on the timeframe one chooses. Such mixed signals mean the market is probably awaiting further clarification from underlying fundamentals before endorsing a trend in either one direction or another. On January 25 ago we saw the exchange rate hit the long-term range highs at 1.1600 on the back of a strong bullish run. It was always going to be likely that it would encounter a tough ceiling of resistance at the range highs which would put downward pressure on the exchange rate. Range highs are a natural place for short-term technical sellers to enter the market even if only temporarily. It is on the back of their selling amidst a backdrop of further political uncertainty that the pair pulled back down inside the range and lost 1.3%. The pair’s regression is not terminal, and there is still a chance the short-term uptrend could reassert itself and push the exchange rate back up to the range highs for another crack at breaking through the ceiling. One chart feature which should bring some hope to Sterling bulls is that the pair has pulled back into what some traders dub the ‘buyzone’, the space between the 10 and 20-day moving averages (MA) (shaded in yellow on the chart above). When pull-backs into this zone occur during bullish trends the usual outcome is that the pair turns around in the buyzone and resumes going higher. One necessary ingredient for expecting such a turnaround would be the formation of a bullish candle inside the buyzone, which so far has been lacking. However, if one does form then a more bullish outlook is likely in the short-term. There is a distinct possibility of this happening in the week ahead. A combination of a bullish bar and a break and close above the 1.1480 highs on the 4-hour timeframe chart, would be the sort of signal which would give the ‘green light’ to further upside, up to a target at the 1.1600 ceiling range highs. Yet the four-hour chart is also showing bearish indications, which explains why we are neutral. Most recently in the last week price action has fallen in a new sequence of declining peaks and troughs. These have formed more than two lower lows (LL) and lower highs (LH) since the January 24 peak. This is the first indication a new downtrend could be forming. As such, a break and close below the 1.1360-1.1340 zone could be bearish for the exchange rate, leading to further declines down to 1.1280 perhaps. Assuming the UK will execute a managed exit from the European Union Sterling as most analysts expected the pair is eventually likely to rise. From a technical viewpoint a successful breakout from the 1.1200-1.1600 range, confirmed by a break above the range highs, would be game-changing. In such a scenario the pair would be forecast to reach 1.1705 initially, at the level of the R1 monthly pivot, but then most probably even higher, to an eventual target at 1.1960 which is roughly equal to the height of the range extrapolated by 61.8% higher - the usual technical method for forecasting range breakouts. 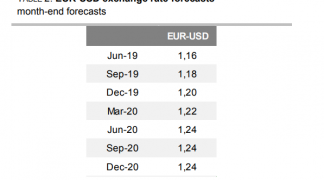 Market sentiment with regards to the outlook for Eurozone economic growth has deteriorated to the extent they are no longer expecting an interest rate from the European Central Bank (ECB) in 2019, rather pushing the date of the first rise well into 2020. The Euro has fallen alongside these expectations. Therefore, we believe risks are to the upside in the event of data beating expectations: should markets get the sense the Eurozone has turned a corner we could well see the Euro come back. While this week's data is second-tier in nature, it is nevertheless likely to be of greater interest than usual owing to the above dynamics. The main release for the Euro will probably be retail sales on Tuesday at 10.00 GMT. Given current market concerns about waning Eurozone growth the data could be critical in gauging the state of the Eurozone consumer and high-street spending, a major component of GDP. 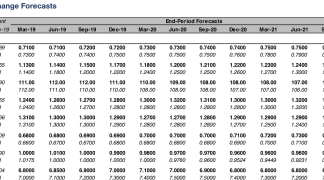 The consensus estimate is for a slowdown of -1.6% in December from a 0.6% reading previously (in November) and a slower 0.5% rise annually compared to 1.1% previously. Clearly, an even lower than expected result would weigh on the single currency and vice-versa for a higher result. 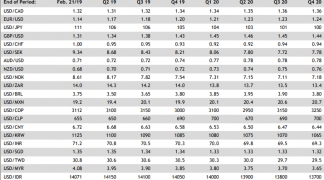 The middle to end of the week sees the release of German data. Concerns around growth in the Eurozone's largest economy of late should see markets pay more attention to the results than would typically be the case. German Factory orders, for example, out at 7.00 GMT on Wednesday, are expected to have bounced back by 0.3% in December after a -1.0% contraction in November. If they fail it could hurt the Euro, if they exceed expectations the Euro could gain a boost. Likewise with German industrial production on Thursday, which is forecast to rebound 0.6% in December after a -1.9% decline in the previous month. Finally, German trade data is out on Friday at 7.00 and forecast to show the surplus shrinking to 18.1bn from 19.0bn Euros in December. This could also be closely watched by market participants trying to assess the impact of the slowdown in China on the Eurozone export market. Recent evidence suggests demand for European cars, for example, has declined amidst the general economic slowdown in China. The economic outlook for the Eurozone as a whole will also get an official assessment from the ECB on Thursday, at 9.00, when they publish their latest Economic Bulletin which should show a number of downgrades to growth and inflation expectations following the reecnt slowdown seen in Eurozone economic growth.